Making Investments in Dryland Development Work: Participatory Scenario Planning in the Makanya Catchment, Tanzania is a new paper my colleagues Elin Enfors and Line Gordon from the Stockholm Resilience Centre and Debbie Bossio from the International Water Management Institute, and I have just had published in Ecology and Society. Below is part of the press release Scenario-planning help small-scale farming from the Stockholm Resilience Centre. “We had two parallel objectives with the scenario planning exercise in Makanya”, says author Elin Enfors. “The first was to analyze how, investments in water system technologies would play out over a range of alternative, but plausible futures, and the second was to initiate a discussion locally about the catchment’s future development”. Developing participatory scenarios also proved to be a useful tool to rapidly assess some of the major hopes, fears, and thoughts about the future among people in the local community. Such an overview is useful in any project, especially in a start-up phase. In this particular case, where the objective was to assess the relevance of investments in agricultural technologies that are intended for small-scale farmers, this perspective was essential because the farmers’ risk calculations and expectations of the future will influence whether or not, and under what conditions, they will adopt small-scale water system technologies. Furthermore, there seems to be a risk that development and applied research projects become trapped in a vision that describes how their proposed interventions will ideally unfold over time. Scenario planning may help overcome such biases as it facilitates an understanding of how the project could develop in different kind of futures and because it improves the understanding of events and processes that either may challenge the project or provide opportunities for it. A way to increase the robustness of this type of investments is to build capacity among farmers for innovation and learning through experimentation, as this will generate benefits across a range of possible futures. The analysis shows that there is not one ideal type of collaborative partner for research and development projects working with small-scale agricultural technology, highlighting the importance of identifying a diverse set of potential collaborators. 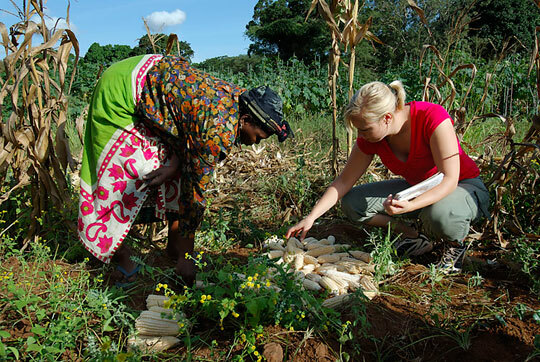 Follow the links for more of Elin’s research in Makanya, and more photos of Makanya catchment.